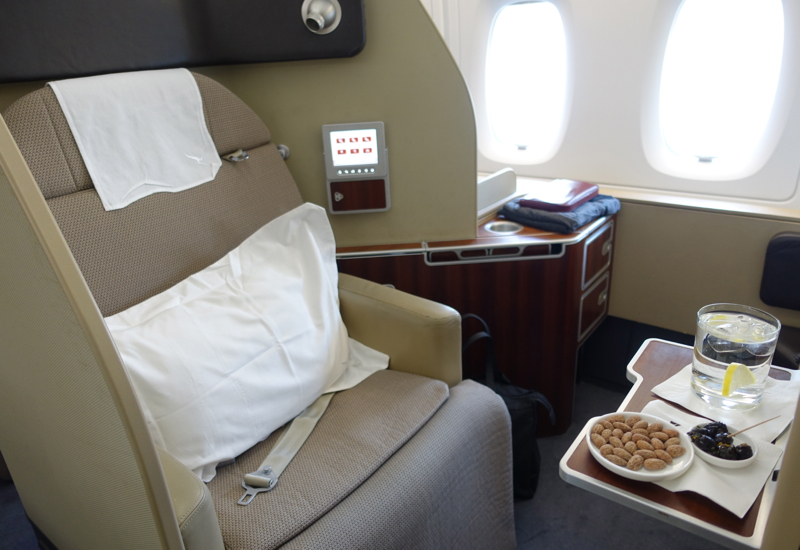 This new Qantas First Class A380 review of a London to Dubai flight is part of a new trip report featuring Emirates A380 First Class, Etihad First Apartment on the A380, and stays and fine dining in some of New Zealand's best luxury lodges and in Sydney, Australia. Qantas First Class on the A380, similar to Singapore Suites on the A380, places First Class on the lower deck, except that Qantas has 14 open suites in a 1-1-1 configuration, with 5 window suites on each side and 4 suites in the center, vs. Singapore Suites' 12 closed suites, which are arranged 4 by each window, with two couple's paired suites in the center. I recommend avoiding row 1 and row 5 due to proximity of row 1 to the lavatories and of row 5 to the galley and to Economy. Although I was traveling with my son, we both like having window seats (also to be able to darken the windows for sleeping, or watching movies) so we chose Seat 2A and Seat 3A, one behind the other. 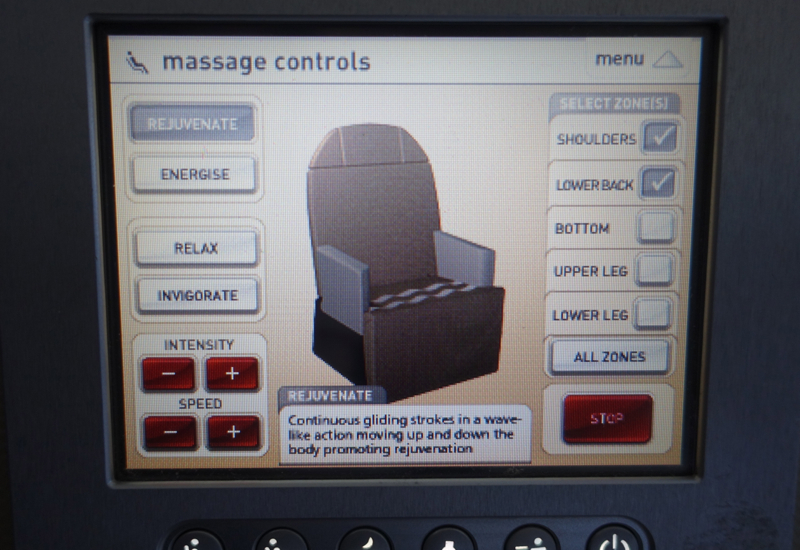 Just as last time, I enjoyed the massage function, which is strong enough to actually work well in the context of airline seats with massage functions. 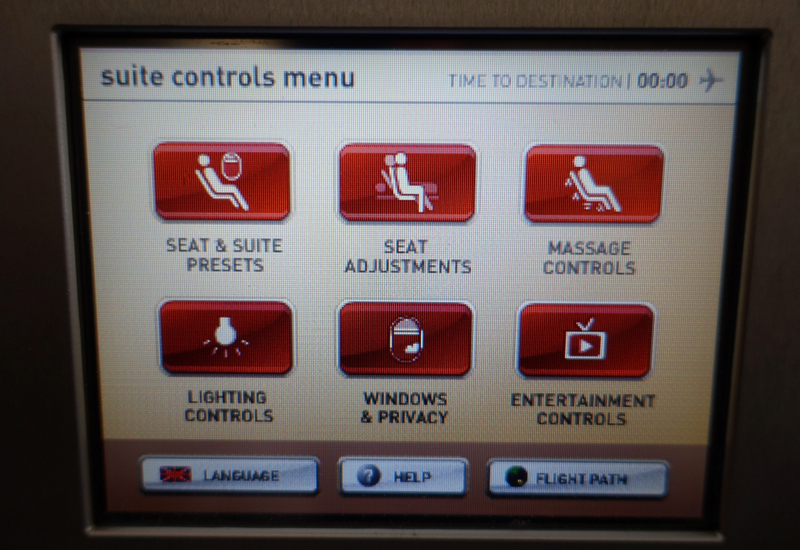 Some seats, such as SWISS Business Class, have virtually undetectable massage functions, but the Qantas seat and massage functions were better than Emirates First Class, in my view. One area where the Qantas First Class experience is a bit lacking is the bathroom, which is small and doesn't have the fresh flower that most First Class bathrooms have. 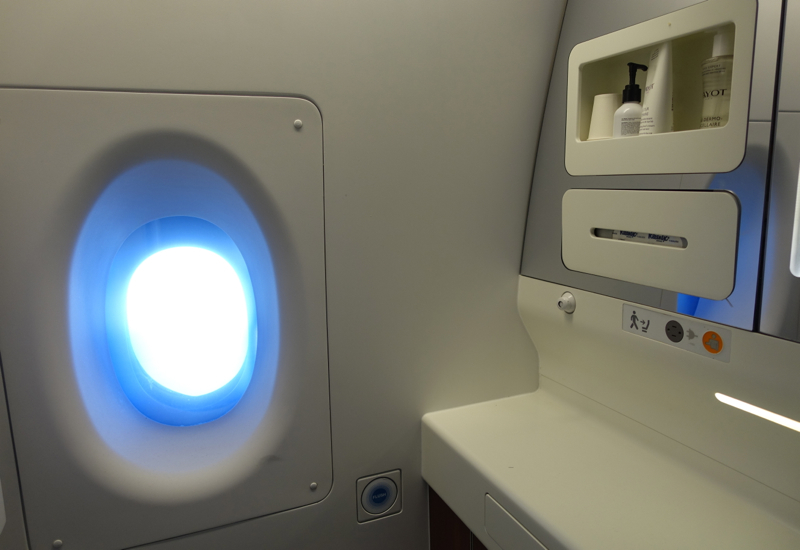 It does have a window, but it would be nice for there to be slightly bigger bathroom with more space for changing into pajamas, as some airlines offer. 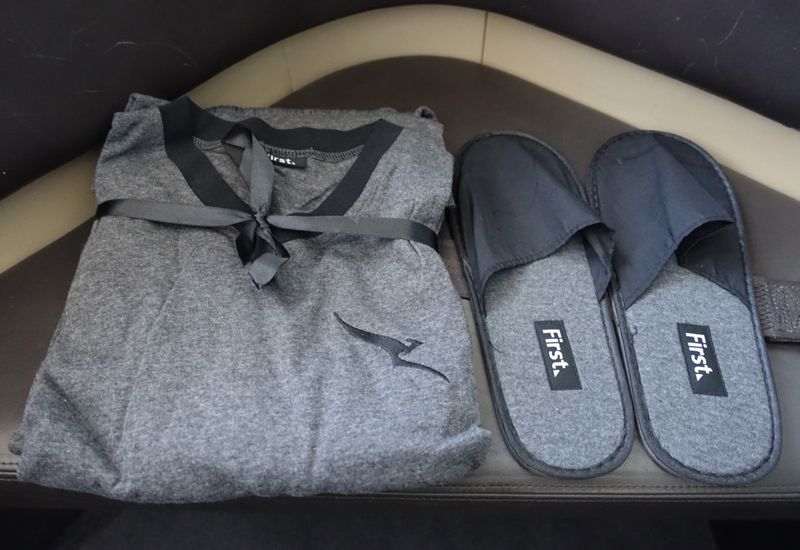 The Qantas First Class pajamas remain the same soft cotton grey t-shirt with black kangaroo logo that I had last year, and the women's red amenity kit, including a mirror and SKII skincare products, was also identical to last time. 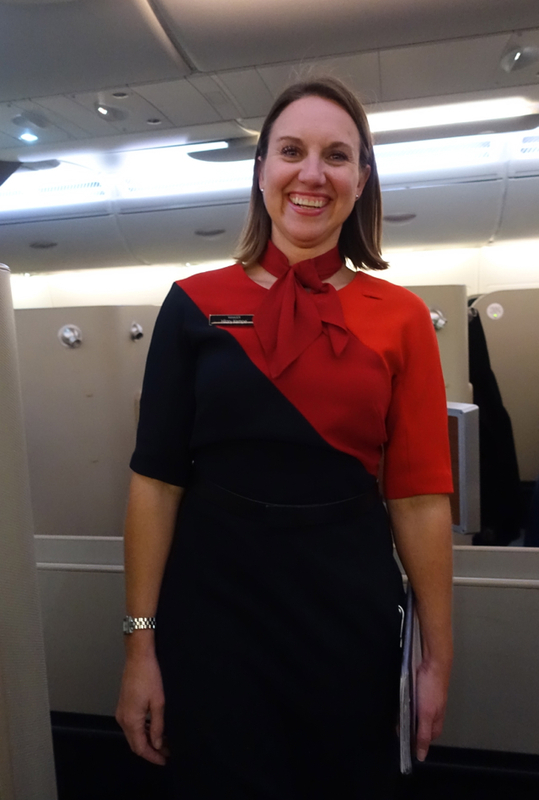 I find the Qantas pajama top one of the most useful of airline pajamas, post flight–there's no “first” emblazoned on it as there is on British Airways First Class pajamas, so I happily wear it as a regular t-shirt for casual occasions. The slippers, however, are slightly annoying since the upper part is flimsy, so they don't slip on as automatically as most hotel slippers, which are thicker and easier to slip your feet into without having to hold the upper part up. 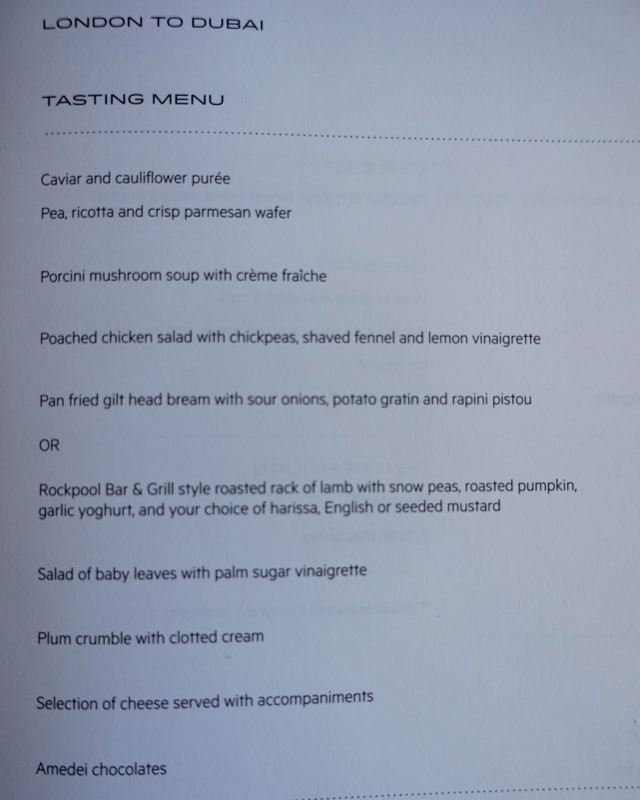 And the tasting menu, which looked tempting, but also too long and too much food, given that I was hoping to get some rest as well. Though given the timing of this day-time flight, it seemed perfect for those who wished to indulge. 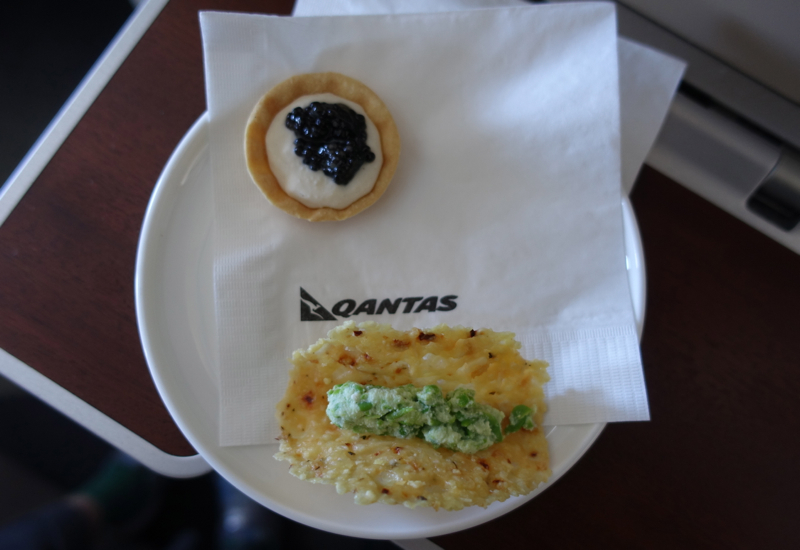 The meal started well with the amuse bouche of a tartlet with caviar and cauliflower puree and a pea and ricotta dip atop a parmesan wafer. The flavors were excellent, and the only issue was that the parmesan wafer was no longer crisp, though that didn't stop my son from enjoying it, especially as he didn't care for the caviar and cauliflower amuse. 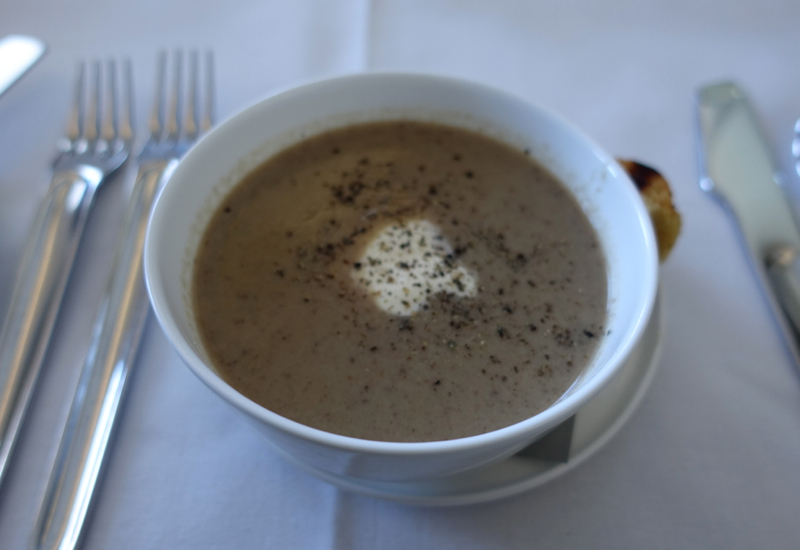 The Porcini Mushroom Soup with Creme Fraiche may not have been much to look at, but it was earthy and incredibly delicious. 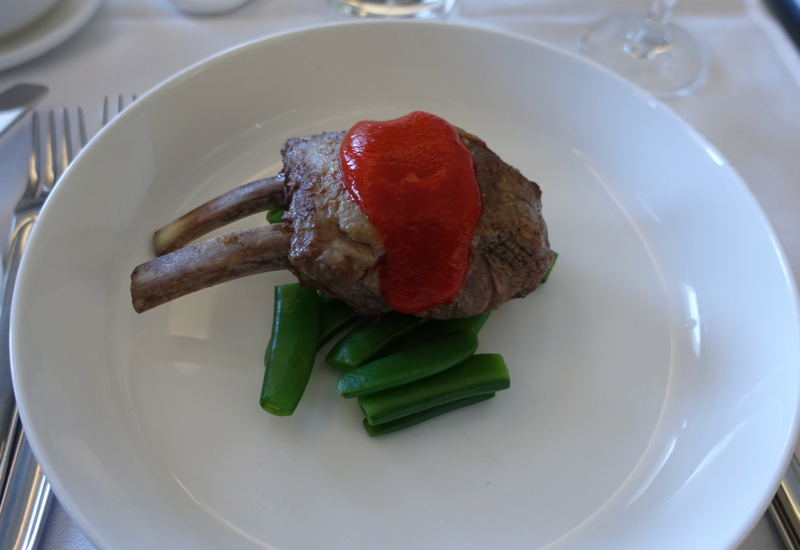 Less impressive was the Rockpool Bar & Grill style roasted rack of lamb, which I found tougher and chewier than most lamb dishes I've had, perhaps because of the roast preparation, rather than braising, which tends to reheat better on flights. I did enjoy the slightly spicy harissa sauce it came with, however. 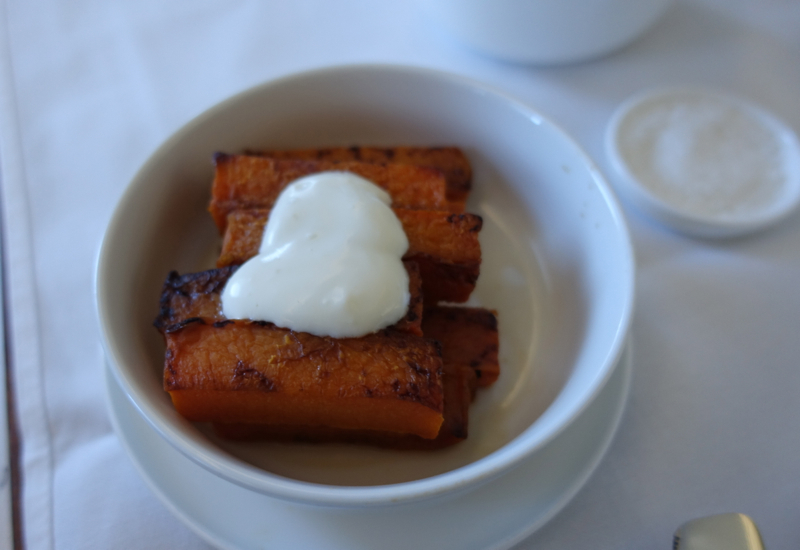 And the roasted pumpkin was wonderfully sweet, making for a nice contrast with the garlic yoghurt atop it. In this case, I preferred the side dish to the main. 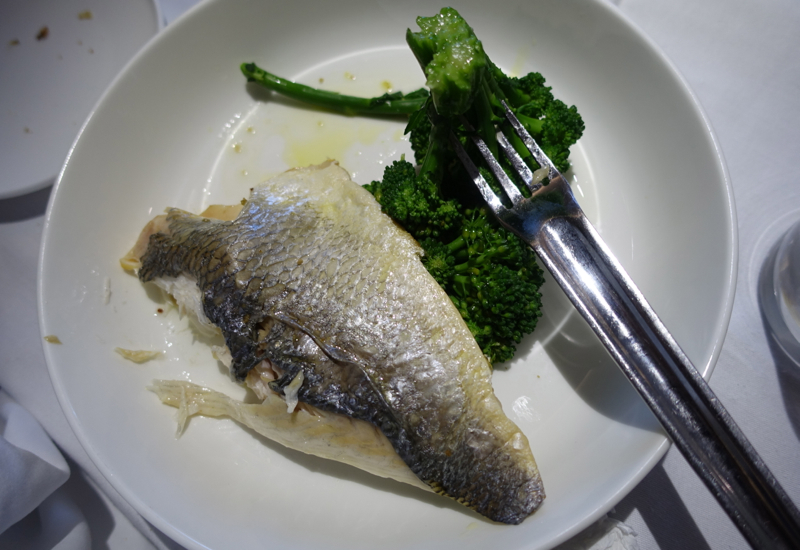 My son was in the mood for fish, so he chose the seared gilt head bream with tender broccolini. 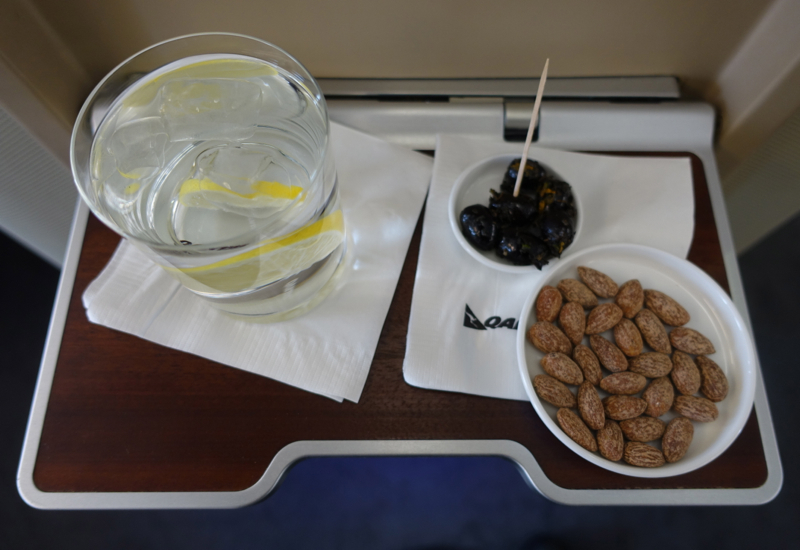 I almost never order fish on flights, because it ends up overcooked, but somehow they managed to cook the bream just right, so against the odds, on this occasion the fish was a better choice than the lamb. We decided to split a cheese plate and a dessert, the Plum crumble with clotted cream. 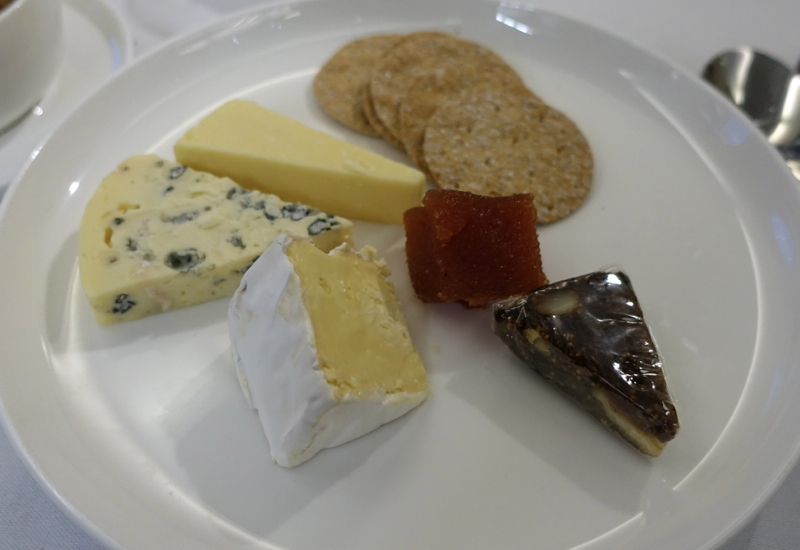 The cheese plate was a solid offering, with nice additions of quince paste and even a slice of fig-nut tart. 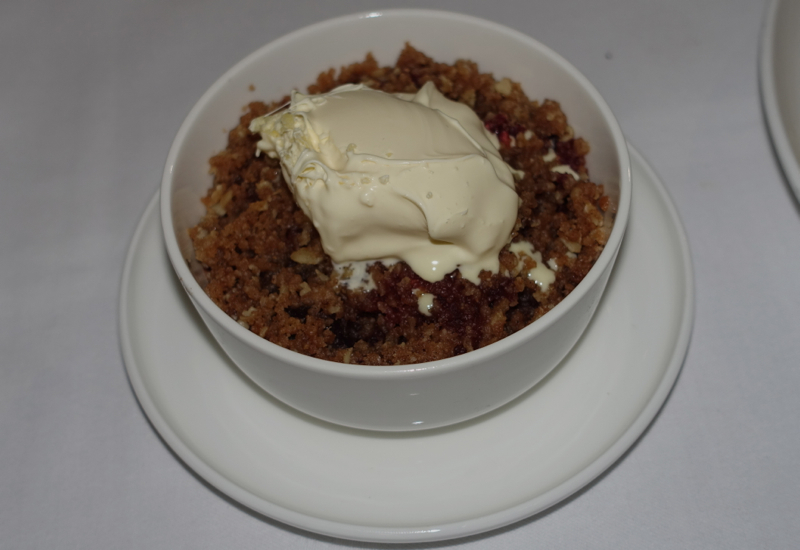 And the Plum crumble with clotted cream was wonderful–as good or better than the ones I make at home, which my family loves more than pretty much every other dessert I make. 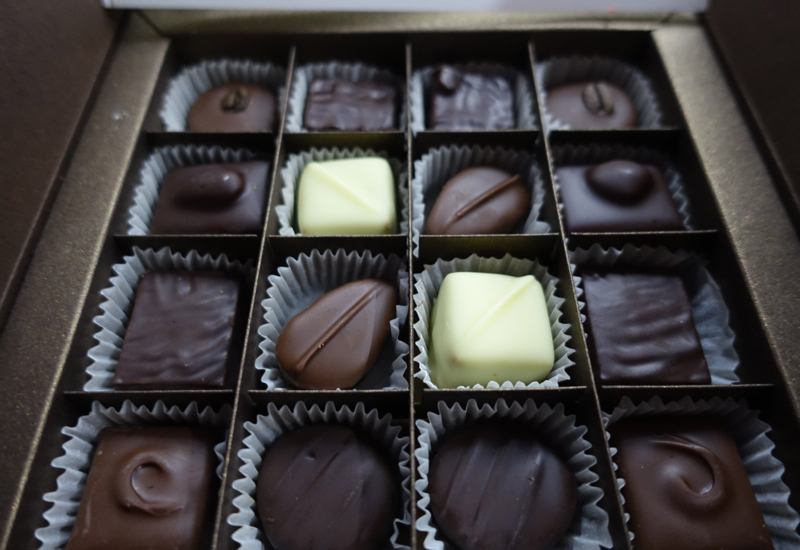 The crowning touch, as last time, were the Amedei chocolates. 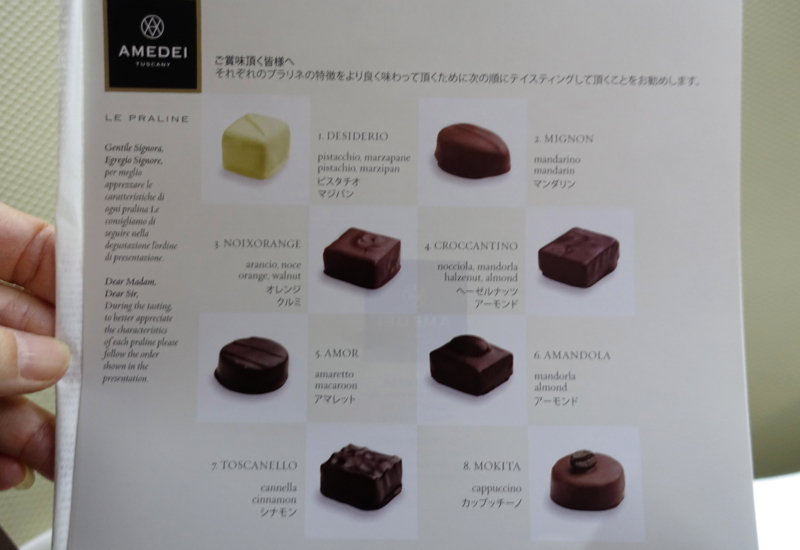 As a dark chocolate fan, I believe Amedei, which is based in Tuscany, Italy, makes some of the finest chocolates, along with a few other chocolate producers such as Bernachon (based in Lyon, France). And Qantas, to my knowledge, is the only airline that serves them, though I haven't been on any Alitalia flights. In any case, since I happened to be the first passenger who asked for them, I was able to take a photo of the first untouched box, and invited to help myself 🙂 I restrained myself to taking two, one for me and one for my son for later, since I'd already brushed his teeth and put him to bed. 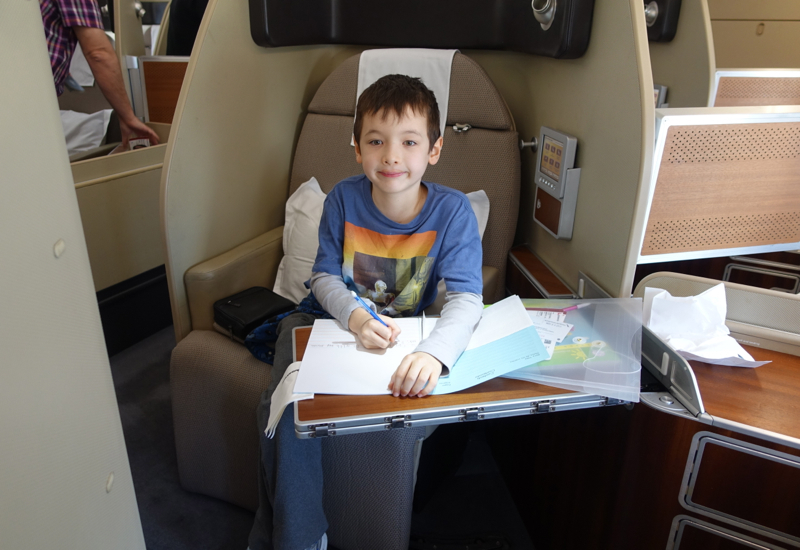 Qantas' first class bed is comfortable enough that my son slept well for a few hours, and I rested comfortably, although I slept more on the subsequent flight. 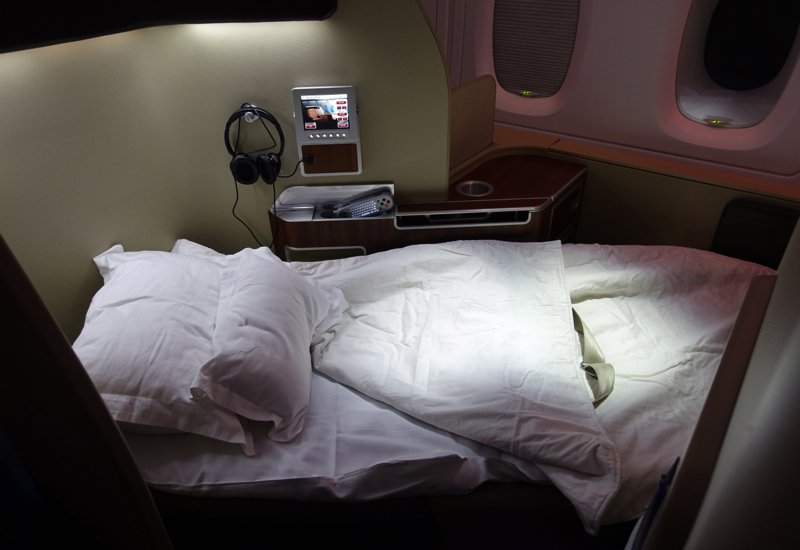 The bed is 79 inches long, so it accommodates guests above 6 feet, though isn't as well padded as either Singapore Suites or JAL First Class, which both use a memory foam-like mattress pad. 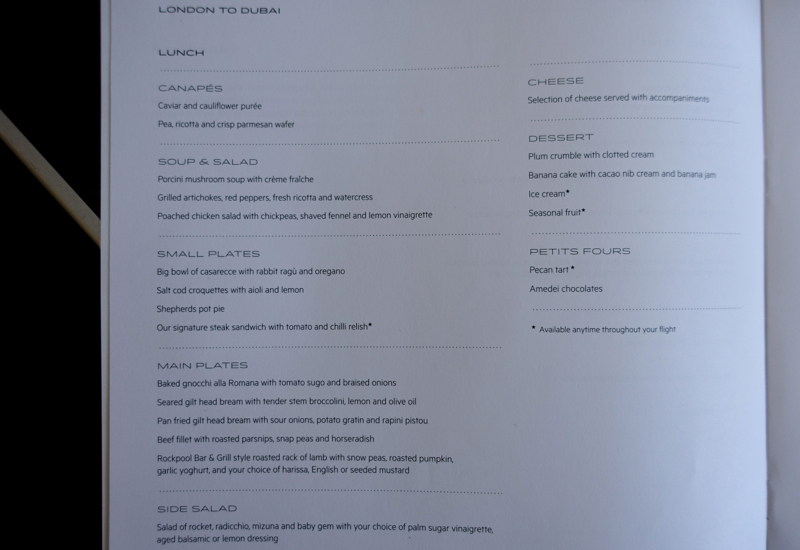 This is the second time I've flown this particular Qantas A380 First Class route from London to Dubai, and it was again a stellar flight, especially given that it's not terribly long. The seat was comfortable, both as a seat, in the recline position and as a bed (although not as comfortable as Singapore Suites or JAL First Class); food and wine were again superb, with the exception of the lamb; pajamas and amenity kit are useful even after the flight, and staff couldn't be more helpful or pleasant. I even got to chat with the same purser (and namesake, since she's also named Hilary) who was on my prior flight, and she kindly let me take the photo below. 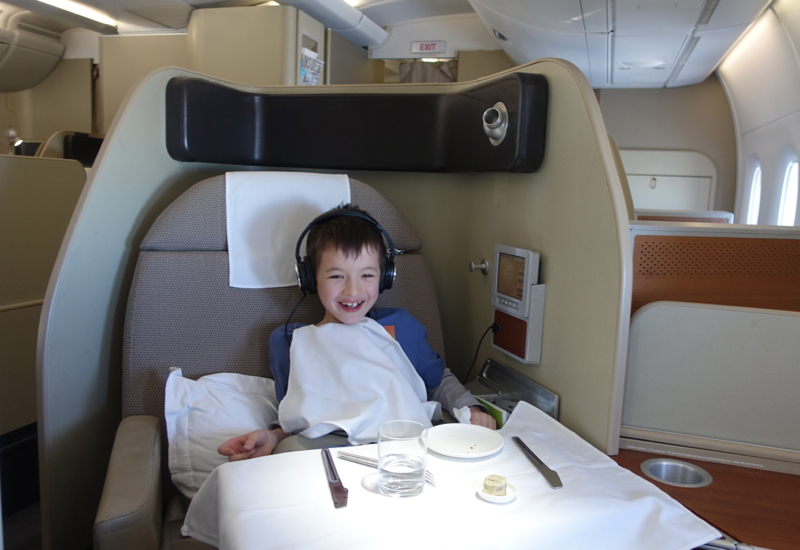 It was a great Qantas First Class flight, and I highly recommend this route. 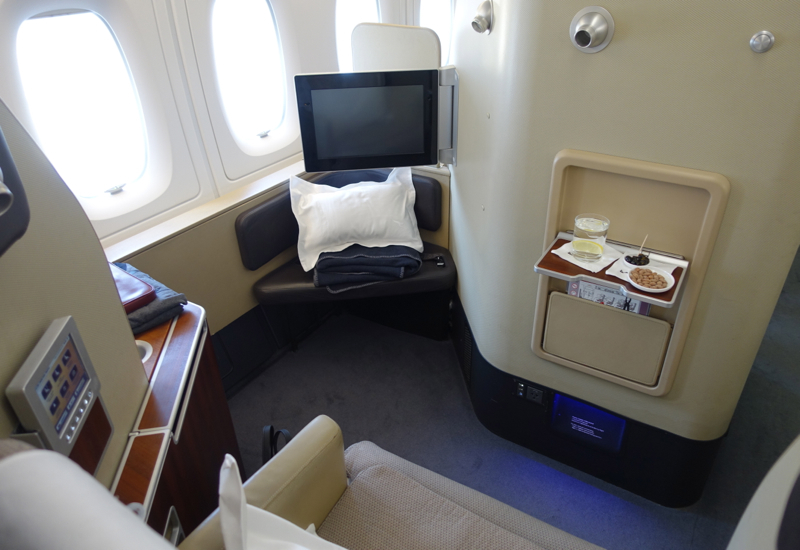 If you've flown Qantas First Class on the A380, what was your experience?